Fill in the form below to calculate your pool’s Langelier Saturation Index (LSI). If LSI Index is between -0.3 and +0.3 pool water is Balanced. 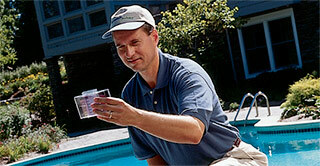 When pool water is balanced, it has no effect on the pool or equipment. There are two values you can readily change to help improve your LSI value to get it into the optimum range: pH and Alkalinity level. If LSI Index is less than -0.3 pool water is Corrosive. Pool water may cause etching, pitting, dissolving and staining of walls, grouting and plumbing. To raise your LSI value, add sodium bicarbonate or baking soda (can be found in pool supply stores). Consult the calculator above to determine the target Alkalinity value (recommended range is 80-120ppm; however, you may find that a level lower than 80 may be ideal for a balanced LSI value). If LSI Index is greater than +0.3 pool water is Scale Forming. Pool water may deposit excess minerals on the pool and equipment. Scale generally appears as white or lightly colored rough blotches on the pool walls. It also adheres to other objects in the pool, piping and filter system. Scale can restrict water flow, shortening filter runs and reducing filtration efficiency. To lower your LSI value, add muriatic acid (can be found in pool supply stores). Consult the calculator above to determine the target pH value (recommended range is 7.2 to 7.6).